Last month, in the height of pumpkin flavored everything, I was craving some pumpkin muffins. I wanted something with a little extra oomph though, and since apples were on sale, I decided to combine the two and bake up these Apple Pumpkin Walnut Muffins. When they came out, I immediately thought "These taste like Thanksgiving!" So, instead of traditional dinner rolls, we will be serving up these muffins at our Thanksgiving dinner this year. They are so moist, delicious, and make the house smell amazing while they are baking. They are definitely my new favorite muffin! • Preheat the oven to 375 degrees F. Grease muffin cups or line muffin pan with greased muffin liners. • In a large bowl, whisk together the flour, sugar, cinnamon, salt, baking powder, baking soda, ginger and cloves. • In a separate bowl, whisk together the pumpkin puree, eggs, oil apple, walnuts and vanilla. • Add the wet ingredients to the dry, stirring to combine until just moistened. Pour the filling into the muffin cups until they are 3/4 full. • Bake for 20 minutes, or until a toothpick inserted through the center comes out clean. • Cool for 10 to 15 minutes. Serve. What is your favorite kind of muffin? Do you serve muffins or dinner rolls for Thanksgiving? These sound wonderful! I like any muffins really. They are all good. Lately I've been craving lemon though. I made lemon poppy seed muffins. They were pretty darn good, and smell great. I love muffins and these sound awesome. They are perfect to grab & go on mornings when I don't have much time to eat. I've always wanted to put some cloves into sponge cakes or muffins but never did it... does it give nice taste? I really like the flavor of cloves Dezzy. I've never had it in a sponge cake, but if you are making one that is more warm in flavor (not fruity) I would imagine cloves would really make it pop! I do love them in muffins too! Yummm...I pinned your post. I love to eat and make muffins! Warm muffin with butter and a fresh cup of coffee! Great way to start my day! These sound and look so good. I love pumpkin and I adore apple-the combo must taste like heaven. I would probably leave out the walnuts-but that is just me. These muffins sound really good but I'll have to take the nuts out since I'm allergic. I love apple recipes. These sounds perfect for the cold season ahead! Besides corn muffins, I have never had muffins with any meal except breakfast. These sound so good and would be wonderful for Thanksgiving morning! Apple and pumpkin are two of my favorite flavors! These muffins would make the perfect warm breakfast on a chilly fall morning. I've never had apple and walnut together! Oooo and pumpkin! so many yummy flavors! These sound like the perfect flavor combo for fall! I love apple and pumpkin. These sound awesome! I'm totally making these this weekend. I love apple and I love pumpkin and I love muffins! Put them all together and it sounds like perfections. I've never made muffins using both apple and pumpkin together... I can't wait to try them! Yum! Looks yummy. I think a lot of people prefer to add natural fruits in their baking and that pumpkin is one of those veggie/ fruits that is great for baking. Those look wonderful, perfect for my morning coffee! I would probably also try Pecans since I have a bag of them sitting on the counter. Yummy! I could totally modify those and make them gluten-free! My favorite kind of muffin is banana nut that my mom makes. I love these I swear I could eat these in one sitting. These sound delicious! I might just try and make them this week. Apple Pumpkin sounds yummu. Interesting combination. Oh man, these muffins sound so good! I love apple and pumpkin, but I never thought to combine the flavors. I bet we will love this recipe, thanks for sharing! You always bake up such delicious treats. These look fantastic and the flavors work beautifully. That's such a great combo of flavors. All sort of fall wonderfulnes! 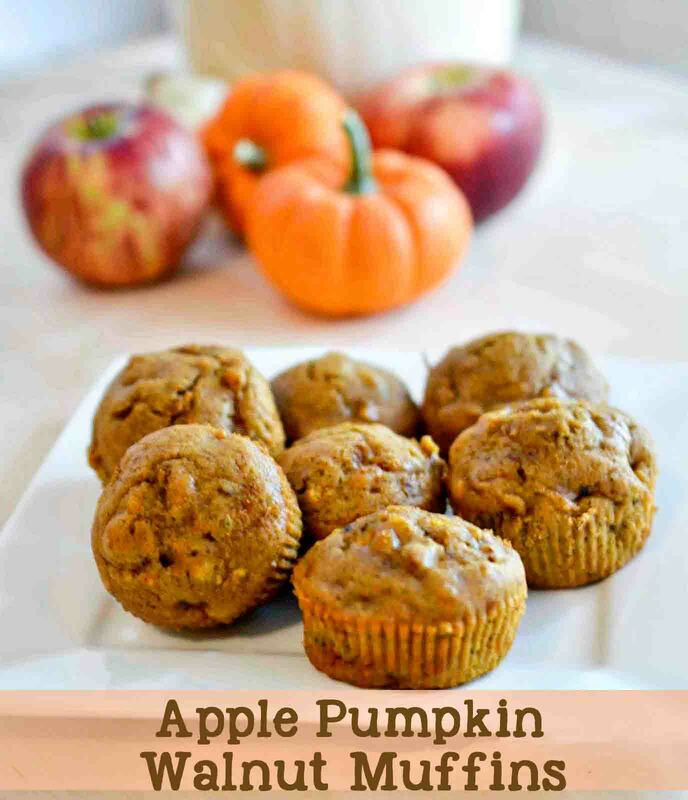 I am a huge fan of muffins and with pumpkin in them they go to the top of my list! These look delicious! Love your pictures too! Thanks for the recipe! Oh goodness your muffins look great. We love everything pumpkin. Thanks for sharing the recipe and I'll add it to our to do list. Mmm! These look super yummy! Mmm, these look amazing. I can almost taste them through the computer! They look soo moist and delcious. I love apple muffins. These look perfect for the season, and you are right they look incredibly moist as well. 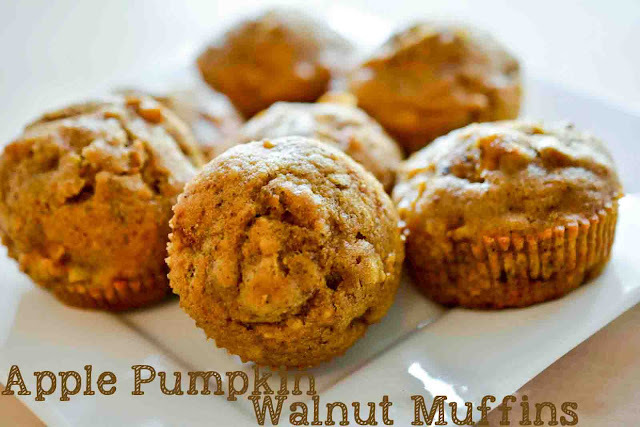 Your apple pumpkin walnut muffins look so yummy! I need to try one. Or two. These look good and healthy! My kids have been wanting me to make muffins lately. I'll make these! Those look really yummy. I love pumpkin this time of year. Its definitely pumpkin season! Thanks for sharing the recipe! I love that you included walnuts into these muffins. They are my favorite nut! Great recipe for the apple sale I scored. I have tons and this will help. These muffins sound and look delicious! Pinning these and adding them to my grocery list! Those look delicious. And are perfect for this time of year. These are great muffins, I have to try them. I have found that muffins are a great way for me to get my picky eater to eat something somewhat good for him! These look wonderful. I could use these, with 5 apple trees in the back yard .